On September 14, 2002, the Public Broadcasting System (PBS) aired a documentary on reconstrucion of the former World Trader Center site in lower Manhattan. The show’s title was “America Rebuilds.” During this PBS documentary, the developer of World Trade Center (WTC) Building 7, Larry Silverstein of Silverstein Properties, said that he and “the commander” of the New York City Fire Department had decided to “pull” WTC Building 7 late in the afternoon of September 11, 2001. The conclusion? Larry Silverstein’s nationally aired statement means, simply, that he and others must have prepared WTC Building 7 for demolition. Could this preparation for demolition have taken place on a single afternoon? As we will see below, because it was a 47-story skyscraper containing 2 million square feet of office space, this preparation must have taken at least several weeks. Several weeks, that is, before Sept. 11, 2001. Controlled Demoliton, Inc. (CDI), of Baltimore, Maryland is one of the world’s leaders in demolishing large buildings. Owned for three generations by the Loizeaux family, CDI details on its website the ‘World Records’ that the company holds in demolishing huge structures — monuments such as the former Kingdome in Seattle. The CDI website also relates the timespans that have been required for the company’s accomplishments. 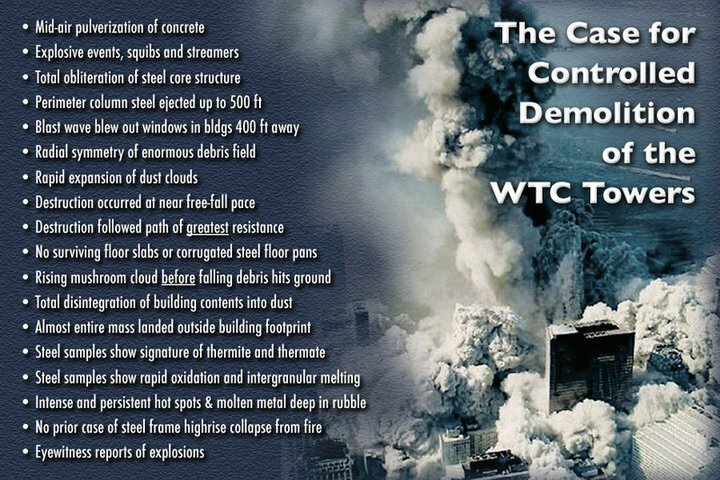 How much time would be required for the planning and emplacement of charges for the symmetric implosion of WTC Building 7 that we saw on 9-11? WTC Building 7 was a 47-story tower that sat less than 100 feet from other skyscrapers. We read on the CDI site about a 17-story building of reinforced concrete in Jeddah, Saudi Arabia — the Sheikh A. Alaki Apartment Building — which collapsed while under construction by the Bechtel Corporation in 1998. A building in Detroit, Mich. of comparable size to WTC Building 7 — the J L Hudson store, standing 35 stories tall and containing 2.2 million square feet — took CDI almost five months to prepare and bring down in 1998. CDI’s 12-person loading crew took 24 days to place 4,118 separate charges in 1,100 locations on columns on nine levels of the complex. Over 36,000 ft of detonating cord and 4,512 non-electric delay elements were installed in CDI’s implosion initiation system, some to create the 36 primary implosion sequences and another 216 micro-delays to keep down the detonation overpressure from the 2,728 lbs of explosives which would be detonated during the demolition. How, then, could the preparation and emplacement of charges to “pull” WTC Building 7 be accomplished in a single afternoon? In particular, during the tumultuous afternoon of Sept. 11, 2001, right there at ‘Ground Zero’? Larry Silverstein’s statement on national television means that the preparation for demolition of WTC Building 7 must have preceded 9-11 by weeks, if not months. Upon a moment of reflection, the developer’s statement also means that al Queda could not be at all involved in this most revealing part of the horrific 9-11 crimes. When we look at the different, but nearly equally obvious, demolitions of the World Trade Center’s Twin Towers, and consider the amount of time needed for the planning and placement of charges to collapse these gigantic structures as they actually fell (straight down into their footprints), we see that the entity which controlled the Twin Towers for decades and which awarded the lease of the Twin Towers to the consortium of realtors headed by Silverstein Properties in April 2001 — the New York Port Authority — must also come under suspicion in the emplacement of the charges that were necessary for the demolitions and the killing of more than two thousand people. Banc of America Securities. The General Motors Acceptance Corporation. The New York Port Authority. We’re led still deeper into the heart of the United States’ financial establishment, for the New York Port Authority is a body long controlled by the family most powerful and manipulative in Manhattan real estate: the Rockefeller family. Of the Rockefellers, the banker David, head of both the Chase Manhattan Bank and the Council on Foreign Relations from the late 1960s into the 1980s, was the main mover behind construction of the World Trade Center from the early 1960s forward. During this period of consrtuction, David’s brother, Nelson, was Governor of New York, and thus, as Governor, the ultimate, nominal boss of the New York Port Authority, the entity that was for many years the largest tenant (with 20,000 employees resident) in either Tower. In October 2000, David Rockefeller’s close associate Peter G. Peterson, who was Chairman of both the Council of Foreign Relations and the Federal Reserve Bank of New York on 9-11, led the multifold-investment company of which he was also Chairman, the Blackstone Group, into purchase of the portion of the mortgage on WTC Buildling 7 that was held by the Traveler’s Group. The lease has an all-important escape clause: If the buildings are struck by “an act of terrorism,” the new owners’ obligations under the lease are void. As a result, the new owners are not required to make any payments under their lease, but they will be able to collect on the loss of the buildings that collapses or were otherwise destroyed and damaged in the attacks. Large as these amounts to insurer corporations are, they’re dwarfed by the post-9/11 financial gains from the “War on Terrorism” accruing to: oil-and-gas corporations such as Chevron, Exxon, British Peteroleum and Royal Dutch Shell; weapons-making corporations such as Lockheed Martin, Northrup Grunman, and General Dynamics; and money-laundering banks and stock markets through which the post-2001 $180-billion-per-year in profits from Afghan-grown opium are flowing. These profits are charted or noted in Waking Up from Our Nightmare: The 9-11 Crimes in New York City, a book Jim Hoffman and I have written. All of these corporations are connected in multiple ways through their interlocking boards of directors and major stock-holders. As of 1993, the Rockefeller family was among the top five vote-holders in 93 of the United States’ 122 largest corporations. As of 1997, the Chase Bank and Citigroup controlled more than half the stock of the privately owned Federal Reserve Bank of New York. Thus, developer and lease-holder Larry Silverstein’s nationally televised statement concerning the decision to “pull” WTC Building 7 is itself the most clear-cut key we now have on the public record for unlocking the whole of the conspiracy which orchestrated the demolitions and the resulting murder of thousands in lower Manhattan on Sept. 11, 2001, as the pretext for more war outside the US and more repression inside.